YouTube has been the gathering place for millions of Aussies and Kiwis for the past 11 years. It's a platform where ideas grow and trends develop—and has become an invaluable resource for brands looking to connect with valuable audiences. This year's Brandcast Australia, spanning across Sydney and Melbourne, brought together top advertisers, agencies, and partners from all across the country. They came to celebrate and learn more about the place where Australians choose to watch video: YouTube. 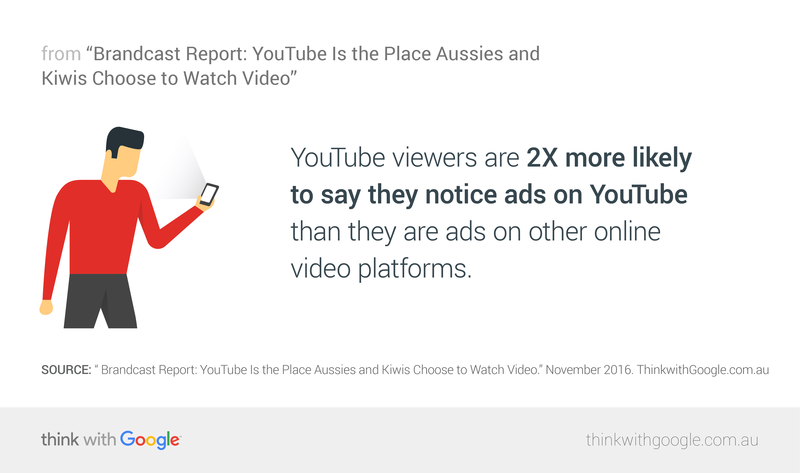 With YouTube watch time in Australia increasing by 40%1 in the past 12 months, it's never been more important for advertisers to understand how to make the most of the platform. Here are three key themes from what brands and creators shared at Brandcast Australia 2016. Fifty percent of watch time in Australia now happens on mobile,1 and brands are taking notice. It's influencing how they approach content and their overall YouTube presence. As consumers jump from device to device seamlessly, savvy brands are right there with them. For Telstra, Australia's largest telecom and media company, video makes up 40% of all its mobile traffic, with YouTube accounting for a great deal of that. At Brandcast Australia, Telstra's CMO Joe Pollard described how Telstra uses YouTube to connect with its customers on mobile, using the platform as "a customer service portal, a product demo channel, and most importantly, a brand storytelling channel." What your brand can do: As you make plans for 2017 and beyond, take a fresh look at where your audiences are spending their time. Instead of replicating last year's media plans, start with a blank slate and map out where you can reach the audiences you want to connect with. One highlight of Brandcast was a summary of a clever YouTube campaign from Campbell's Soup, which was designed to connect with consumers as they search with intent. Viewers were served one of 1700 creative messages related to their searches, with the campaign's message claiming a soup for every occasion. Anyone who searched for Beyonce's "Single Ladies," for example, was served an ad asking if they needed "dinner for one." By tapping into the mindset of lean-in viewers on YouTube, the campaign was a huge success, driving a 55% lift in sales. What your brand can do: YouTube's audiences are engaged and ready to consume your brand's ads and content. When you can create content that's unskippable, your brand will earn more attention and see greater business results. At Brandcast, we announced two new products designed to help brands capitalise on engaged viewers. One is TrueView for action: Brands can now display call-to-action banners at the bottom of your video ads to get consumers one step closing to purchase. The other is Google Preferred Breakout Videos. This new category gives advertisers an easy way to serve ads before the hottest trending (and brand-safe) videos on YouTube in real time. One theme covered in nearly every Brandcast Australia speech is how YouTube influences culture. So many of today's watercooler moments start with and are shared via YouTube—with YouTube creators regularly setting trends and shaping culture. This is true in Australia in particular, where 33 creators have more than 1M subscribers, making it one of the highest creator countries per capita. Creators Casey Neistat and Elise Strachan (of MyCupcakeAddiction) were on hand at Brandcast to talk about their experiences with building followings on YouTube. The content they create couldn't be more different—Casey's video on his way home from Brandcast about his one-in-a-lifetime first-class ticket is his most-watched video ever while Elise's videos are more the stiletto cupcake variety—but both believe that their success comes from their ability to connect with real people as real people. This kind of authentic, viewer-friendly environment allows brands to use the platform to communicate directly with their fans. Take a little movie called Star Wars: The Force Awakens. Kylie Watson-Wheeler, managing director at The Walt Disney Company ANZ, explained the success of the brand's livestreamed unboxing event. Lots of people tuned into the livestream, but perhaps more significantly, fan-created content inspired by the event kept the conversation going. Australian fans created their own unboxing videos and remakes of the trailer, which expanded the reach of the campaign and promoted both the film's release and its merchandise. What your brand can do: Whether your brand teams up with a popular creator, advertises in front of creator channels, or creates its own content, look for ways to tap into the unique properties and environment of YouTube. Viewers want to connect with people and brands that create great content—and that's the kind of advertising that's truly unskippable. 1 YouTube internal data, 2016, Australia. 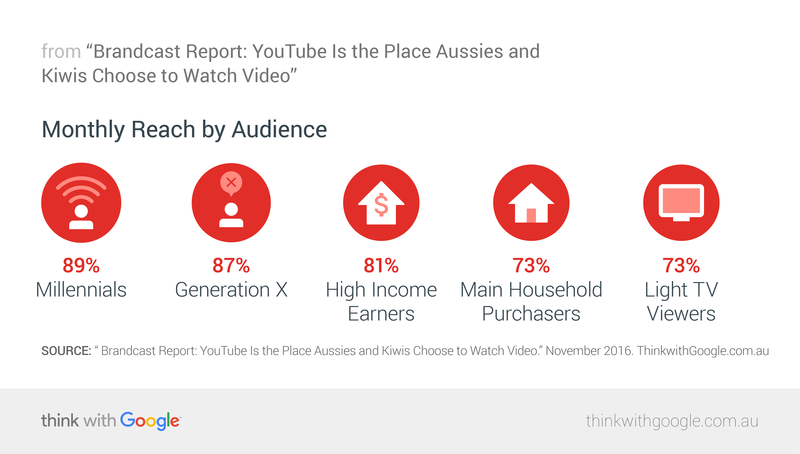 2 Google/Ipsos, "The Australian Video Landscape," August 2016, Australia, n=1525 online Australians 18–54 years old. 3 Nielsen, "CMV Survey," April 2016, Australia; fused DRM, May 2016, base=Australians 18+. Light TV is defined as 8 hours/week of commercial TV, 5% per week of non-commercial TV.